Do you pay out your L$? And if so.. what do you buy for the money? Collected some L$ via my Marketplace Sales and didn´t do much with it apart from paying rental for my land or texture and mesh uploads, it looks like I saved a good bunch of Linden Dollars on my “Bank Avatar” and maybe I should pay out next days. I do it every now and then. And there comes the question what I would do with the money. And I am nosy if you pay out and what you buy for the money. Do you share your experience? In the past I bought a lot of stuff for my fish tank in real life. As I get Second Life money on the paypal account, the best way to spend it is shopping in the internet and you know there are lots of shops which support paypal. If I am true my payouts aren´t that massive but at least after some month it can become a good amount for smaller stuff. I purshased very cool plants for my fish tank, fertilizer for these plants, I made a 30$ bargain for a Co2 equipment (used) on ebay which cost new more then 150$. Yea the Co2 bargain was a real blast and payed with money which came from Second Life. I also bought food for my fish and some stuff for my cat. Last year I bought a game via gamersgate and I did pay a lot of World of Warcraft Gamecards with my Second Life money. Yea I think thats what I did with the money in the past 3 years. It wont make me rich.. thats what I learned. So monthly that money is not a big pot but if I save it a little bit, it can indeed help me out ever and anon 🙂 That is funny. Yes I know my Second Life is untidy but there is no tendency to improve. There is really a difference between my first and second Life. Yes I clean up my rooms every day in my first Life but does that mean its fun to do the same in Second Life? No really.. I do not see much reasons why I should clean my Second Life land, skybox or sandbox. Its sometimes so that I let differend objects on my land because I still want to finish the piece so that it is a finished product some day. Yea… someday! Thats the problem.. I work on differend objects but I do not make my own timeframe when it has to be finished. I see no reason for that as Second Life should be fun and not work. And I work only if it doesnt feel like work. That means if I am inspired. Then I do love all the work but as I said it doesnt feel like work then. However… there is no tendency to improve. I think its somewhat cool to be that differend in Second Life compared to the real Life. Im not sure. Its funny to find ideas from the past, yes. But its really not so that my virtual area is the only untidy place. There is still my inventory which beats that! I think I would be lost without a search function. My inventory is a real mess and cluttered with tons of own pojects or bought stuff like clothes and whatever. Is your Second Life so untidy like mine? For sure I am happy about each comment. Today someone asked me how I did set up my Banner under each of my posts on the Second Life Forums. I want to explain that now, because it is maybe helpful for others as well. Be sure.. it is really easy. First Go and login in to the Forums. 1. At top on the right side you can see “My Settings”… click it. 3. There is a row called “Signature”… there need to be your html-code. When you did add your own html-code there. Just click on “save”. Now you will have your banner under each post you write in the forums. 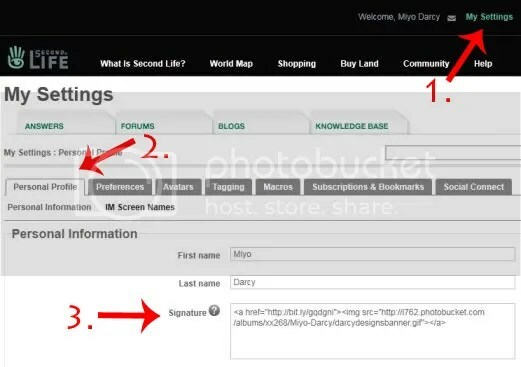 Additional information: If your URL or the URL of your picture is to long.. you can use an URL-shortener.. for example bit.ly. There you can generate a short URL if yours is to long. Battlefield 3 System Requirements revealed! Ok the heading of the blogpost is a lie. In fact the System Requirements for Battlefield 3 aren´t revealed now and that is my problem! Long time ago I did play Battlefield 2 with all my friends but after that time we had a huge brake with ego shooter´s because we did play World of Warcaft most of our time then. I must admit he infected me with his euphorias about the coming Battlefield 3. Ok so I checked the internet if there are any System Requirements revealed but in fact they arent revealed yet. All what we know is that it will use the Frostbite 2 Engine. So I am not sure if this will be enough. Should I upgrade to a better videocard? I also could upgrade my 4gb Ram to 8gb Ram? I dont know if those games use 8gb.. Im not sure if this will be an improvement. If I would need a new CPU.. Then I can buy a new mainboard because I cant use higher CPU`s then this with my mainboard.. Oh and if I would need a new mainboard.. then I also need new DDR3 Ram and that would cost me a lot all together. EDIT: Since I was able to start the BETA of Battlefield 3, I can tell you that the game works on my system very very well without performance issues. The only change on my system is that I bought a Gainward GTX 570 Phantom. No FPS Problems. BF3 is running smooth on my system. What kind of Groups did you join in Second Life and why? Today I cleaned the List of Second Life Groups I am in. So I had to ask my self for each Group why this Group could still be useful for me in the Future. Then I came to the idea to write a little Blogpost about that Topic. So here comes a List of Groups I´m in and I would like to suggest. I would be happy if you leave a comment here as well. Maybe you have some Groups you want to suggest too and maybe you think that you are in some Groups which are defenetly worth to join. So here comes my List…. “College of Scripting Music Science” That Group helped me out several times when I had Questions about Second Life scripting. If you are scripter in SL or somone who want to learn scritping, you should join. This Community is very friendly and there is open Groupchat where you can ask your LSL related Questions. A very cooperatively Group of Peoples. “Builder’s Brewery” This Group is for Builder. You can share Informations or ask for help. Its for beginner but also for experienced Builders. You also will be informed there about Lessons and Classes and other helpful Meet-Ups. “Builders Exchange” Same like above. 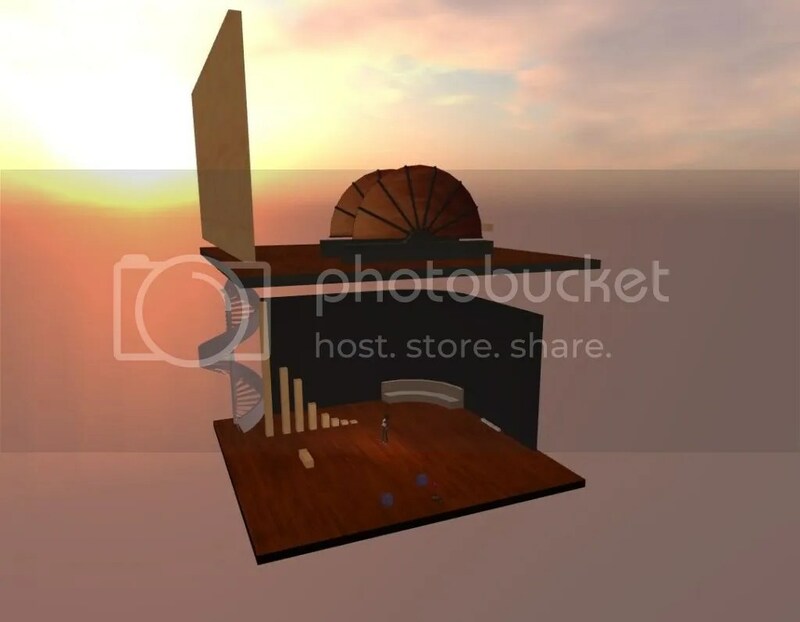 A Group for Builders to share Informations or ask for help. “Phoenix Viewer Support” I think I dont need descripe because the name says already everything. So join if you use the Phoenix Viewer. “Housemusic All Night Long” A Group for those who want to find best House-, Electronic- and Minimal Partys. They inform you time by time via Groupchat or Notecard. “SoNiC DoPeHeAdZ” Here again a Group for those who like to find Partys and Events with Electronical Music. Mostly Underground stuff as well. “Club On Call” Thats a Group for Clubowner, Clubmanager and so to find peoples who need Job. You can place an offer in the Groupchat but you shouldn´t spam or advertise.. thats clear. Indeed this Group is also for Peoples who would like to find a Job. So they could ask in the Chat as well. I am in some more Groups which are more privat or not worth to mention because they are my own 😛 So above.. that was my List which I would defenetly suggest. Today I did read that Guide and found some very helpful Tips and Tricks about SEO “Search Engine Optimization”. How to use Phoenix Viewer, Firestorm Viewer or any other TPV with xfire! I know some of us use the xfire Tool beside the games we play as this is the easiest way to make screenshots, videos and upload it fast without trouble. In addition xfire lets us broadcast our online activity if we want to, on a very easy way. So for sure we want to use this Tool with Second Life as well. But the main problem is that xfire only supports the official Second Life Client. 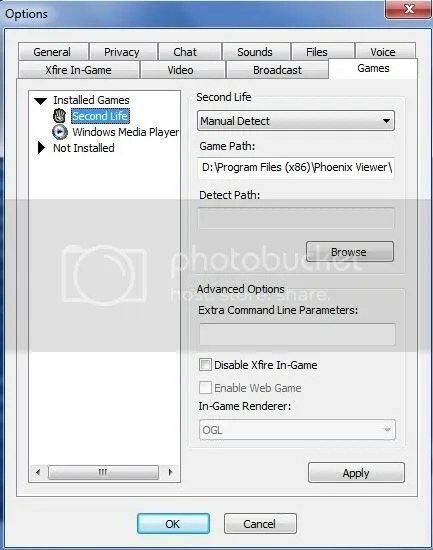 Lately a friend asked me howto add a third party viewer like the Phoenix Viewer to xfire (Indeed this is probably working with all other TPV´s). And I thought this is something which could interest other peoples as well. 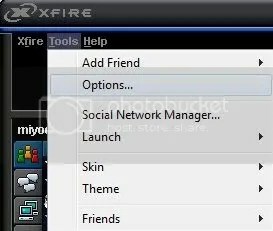 If you still dont know whats xfire for, just see what Torley wrote about this wonderful Tool here. Or take a look at the Official Xfire Website. 4. Now if Second Life is not in the list on the right site, we just have to find Second Life in the “Not installed” List. If Second Life is already in the List of “installed Games” you just have to click on it. 5. Change Second Life from “Automatically Detect” to “Manual Detect” and set the “Detect Path” by click on “Browse” to your renamed “SecondLife.exe” in your Phoenix Viewer Folder. 6. The final step is to click on “Apply” to save this settings.